The leaflet below can be downloaded and printed on a single double-sided page, and handed out before the election. Please do, if you are so inclined. Watching: FOX News Isn’t News. It’s a Political Operation. Bertha Lewis, the head of Acorn, together with Bill Lipton and Dan Cantor of the Working Families Party joined the battle to help us save our homes at Independence Plaza, a 3,000-person Mitchell-Lama development. 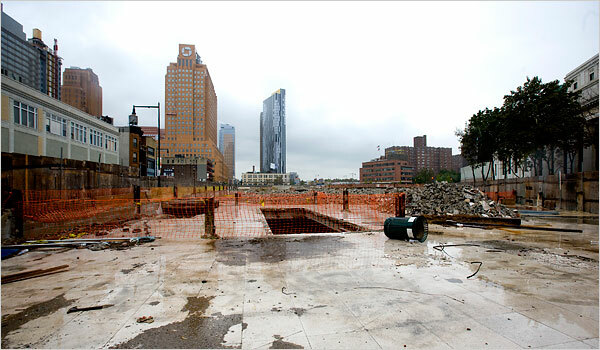 Michael Bloomberg and his housing administration were on the other side of course. To watch the Republican attacks on Acorn while the financial industry’s rip-off artists and war-profiteers go unpunished is hard to stomach. And to see the Democrats caving to the propaganda machine is doubly hard. This video is worth watching. * As if refusing to leave while a sports reporter interviewed pitcher CC Sabathia about the Yankees winning the pennant wasn’t enough — Bloomberg is continuing to use the Yankees to boost his campaign. * WNYC reports about Bloomberg defending his staff’s monetary contribution to Newark Mayor Cory Booker after receiving Booker’s endorsement. * The Village Voice reports that ex-Bloomberg City TV exec Trevor Scotland will be pleading guilty to stealing ad revenue that was due to the city. * And finally, we’ll leave you off with some satire about conservative media from Bob Salzman. * The Post leads with a question by a Bronx resident who asked about the city-subsidized $1.5 billion Yankee Stadium, which Bloomberg defended as a solid investment. Thompson countered that Bloomberg handed big tax breaks to his “developer friends” and is behind schedule in razing the old stadium to create space for the residents there. * Times reporter Michael Powell thought Thompson was able to raise his debating game while Bloomberg sidestepped difficult questions with relative ease — except for contracting his face in distaste when asked about being out of touch with New Yorkers. * Adam Lisberg leads with the candidates debating taxes and the budget deficit. * Celeste Katz and Erin Einhorn are surprised Thompson didn’t ask voters to show party loyalty by voting against Republican Mayor Michael Bloomberg. They were also surprised by the mayor’s aggression. “We don’t know what Bradley Tusk and Howard Wolfson were feeding him before air time,” they mused. * David Chen thinks Bloomberg won the debate. 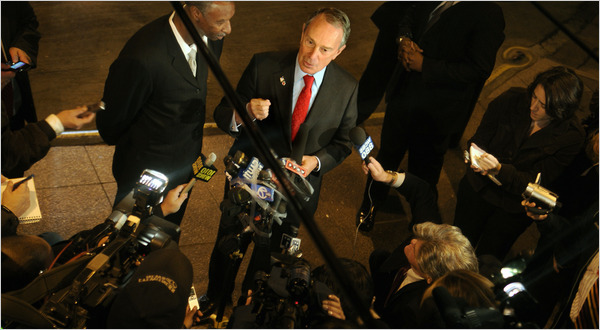 From time to time we’ve been reporting on the New York Times’ shameless promotion of Bloomberg’s candidacy. Robert Parry is an astute observer of mainstream media’s increasingly right wing-tilt. On the surface, this account has nothing to do with Bloomberg, but we are mindful that the money against the people war that Bloomberg’s candidacy represents is being played out in Washington across every policy issue. New Yorkers, who overwhelmingly support real health care reform and Obama, should understand that Bloomberg’s defeat in the face of such a crushing media and money advantage would send a powerful message that The People are still out there. The only reason that many, if not most politicians here or in Washington sometimes do the right thing is because they worry about the people. The American mainstream media is in another snit, having misjudged the prospects for the public option on health care almost as completely as big-time journalists bungled the reporting on the Iraq War and a host of other important stories during George W. Bush’s presidency. Indeed, if you had listened to all the supposedly knowledgeable journalists covering the health-care debate on Capitol Hill, you might have been shocked to learn Monday that Senate Majority Leader Harry Reid was putting a version of the public option in the bill that he is bringing to the Senate floor. For instance, CNN’s Dana Bash has told listeners to her “no bias” news network that the only piece of legislation that mattered was the one emerging from the Senate Finance Committee, a position shared by nearly all the other “smart” journalists and pundits. That’s why, they said, they were devoting so much time to covering every twist and turn of the committee’s negotiations. That devotion wasn’t shaken even by the strange legislative concoction that emerged from the Finance Committee. Since it didn’t include the public option, the insider thinking was that the idea was effectively dead, though a public option was included in the four other committee-approved bills, all three on the House side and one from the Senate Health and Labor Committee. Still, Bash and her MSM colleagues told us that the Finance Committee bill would be the framework for final congressional action and the other four bills would be mostly cast aside. After all, the Finance Committee bill had the support of one Republican, Sen. Olympia Snowe of Maine. That conventional wisdom remained set in concrete despite many Democratic members of Congress indicating that the public option was alive and well – and despite opinion polls showing that the American people favored a public option by about a 2-to-1 margin. So, when the MSM’s smug certainty went up in smoke on Monday, as Reid announced that he would include a version of the public option with an opt-out provision for states when he takes the legislation to the full Senate, the journalists were in a foul mood. A new consensus quickly formed that it wasn’t that their reporting had been lousy, or that the public option made a lot of sense. or that the people’s will was finally being respected. It was that Reid had betrayed them by caving in to the left-wing base of the Democratic Party. A petition drive, no less. Citizens signing a petition urging their elected representatives to take a position favored by a large majority of the American people. How nefarious!